A portable clock that you wear on your wrist, a wristwatch can say a lot about your socio-economic status and your role in the world. Balance wheel, pallet fork and escapement wheel. Timekeeping Accuracy: ± 2-6 seconds/day under optimal conditions. A mechanical movement is powered by a mainspring barrel which turns a series of cogs connected to an escapement wheel that that are regulated by a balance wheel which allows the watch to tick at a constant rate. For most watches, that rate is 6 beats per second, or 21,600 beats per hour. This beat rate is what gives mechanical watches their distinctive "smooth sweeping" second-hands. The user must wind up the mainspring daily in order to keep the watch ticking. Factors affecting watch accuracy include gravity, external shock, lack of maintenance, and improper calibration of the balance wheel regulator. Automatic mechanical watch movements remove the inconvenience of having to wind your watch daily by attaching the mainspring barrel to a lopsided "rotor" which rotates via the kinetic movements of your wrist, winding the mainspring automatically. Automatic watch rotors can add additional heft and thickness to a watch case, so it is a rare feature in thin profile watches, such as dress watches. Electric watch movements were an awkward stop-gap between mechanicals and modern day quartz movements. Instead of a mainspring and balance wheel, electric watches used an electric tuning fork vibrated via a solenoid, powered by a battery cell. 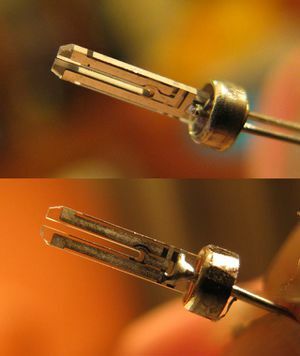 A piezoelectric quartz tuning fork. Timekeeping Accuracy: ± 0.1 seconds/day under optimal conditions. A quartz crystal movement is powered by a battery cell, which oscillates a piezoelectric quartz tuning fork at a rate of 32,768Hz. An integrated circuit chip actuates the clock gear train by one second every time it counts out 32,768 pulses from the quartz crystal. To conserve battery life, the second hand is actuated only once per second, giving them their distinctive "tick". Battery cells can last from 2-10 years. Factors affecting watch accuracy include temperature fluctuations and external shock. Like automatic mechanicals, kinetic quartz movements substitute a consumable battery with a capacitor charged by a lopsided "rotor" which rotates via the kinetic movements of your wrist, charging the watch automatically. Many watchmakers fail to design a long-lasting capacitor, so many kinetic watches stop functioning after 10 years, making their convenience over battery powered watches redundant. This page was last edited on 24 February 2016, at 06:30.